The 2015-2016 PBA Philippine Cup saw a milestone yesterday after Blackwater Elite notched its first ever win in the Philippine Cup at the expense of Meralco, while Rain or Shine edged out San Miguel Beer for the top spot in the league table. Blackwater showed uncanny poise down the stretch to fashion a 92-90 victory over favored Meralco Wednesday and crash the win-column in the 2016 Smart Bro-PBA Philippine Cup at the Mall of Asia Arena. Carlo Lastimosa’s runner he kissed off-the-glass enabled Blackwater to avoid the ignominy of blowing an 18-point lead and, according to coach Leo Isaac, will hopefully set the tone for the team in what promises to be a very tough stretch ahead. Following a Blackwater timeout, Lastimosa received the inbound and drove right straight to the middle of lane before letting go with his looping shot that banked in, only 1.8 ticks left. 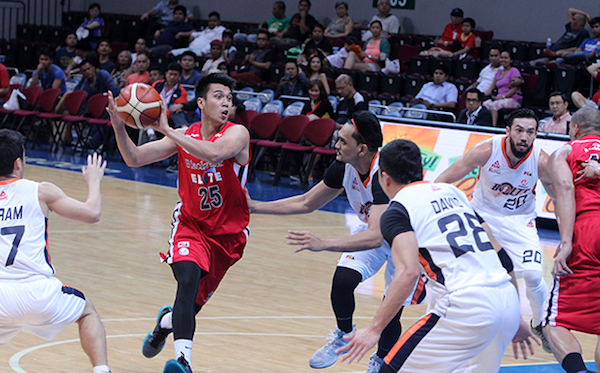 Without any timeout left, Meralco had no choice but to opt for a prayer of a shot which Ronjay Buenafe delivered, but fell way short just as time expired. The loss was the second in as many games for the Bolts, notwithstanding The game-high 23 points by Gary David and Cliff Hodge’s 13 points and 14 rebounds. John Paul Erram notched 14 points before fouling out with still 4:35 left, while Reil Cervantes, Mike Cortez, Riego Gamalinda and James Sena had 12 markers each for the Elite. Lastimosa, acquired from Barako Bull in an off-season trade for Brian Heruela, wound up with 11. 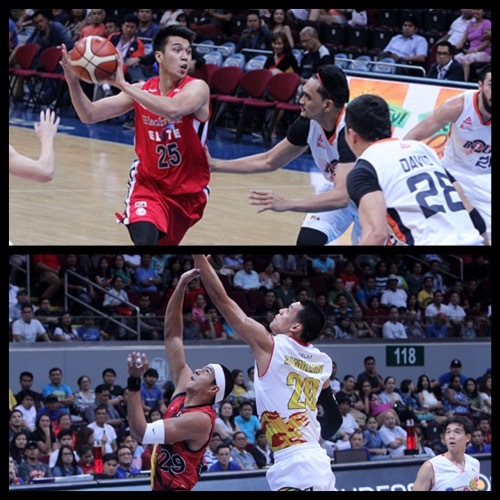 Mike Cortez (BLA) - 12pts, 7rebs, 7asts, 1stl, 6/10 FGs. Cliff Hodge (MER) - 13pts, 15rebs, 3asts, 2blks. Arthur dela Cruz attacks the swarming Meralco defense. 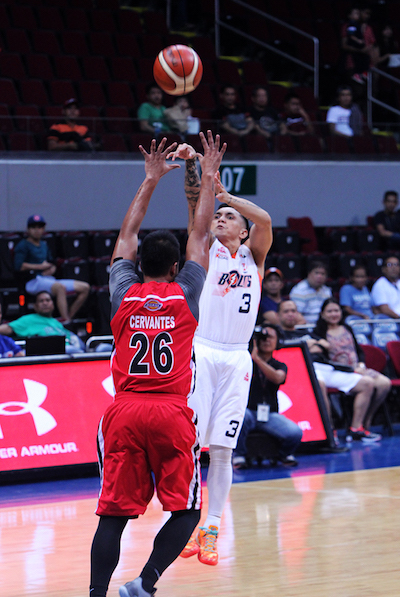 Jimmy Alapag pulls up over Reil Cervantes. With its tremendous shooting coupled with lockdown defense in the final half, Rain or Shine humbled reigning two-conference champion San Miguel Beer, 99-84, to gain solo lead in the 2015-16 Smart Bro-PBA Philippine Cup at Mall of Asia Arena in Pasay City Wednesday night. Gunners Gabe Norwood, Jeff Chan, Chris Tiu, Beau Belga, and Jericho Cruz all connected from beyond the arc, and the Elasto Painters neutralized June Mar Fajardo in nailing a third win in as many games in the all-Filipino tourney. 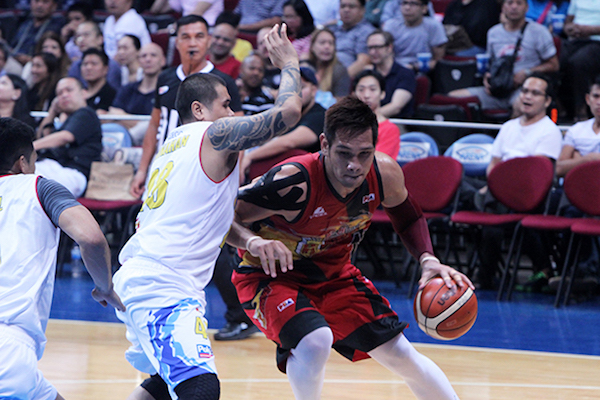 The E-Painters did well on defense, holding Fajardo down to 13 points and 10 rebounds, while at the same time limiting the SMB shooters to only seven three-pointers. 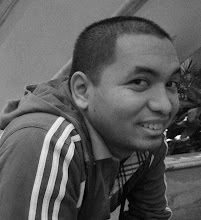 Maverick Ahanmisi finished a couple of the Painters’ transition plays, and the rookie guard wound up with 14 points, five rebounds, four assists, and one steal against two turnovers. Raymond Almazan (ROS) - 15pts, 10rebs, 2stls, 2blks, 6/11 FGs. June Mar Fajardo (SMB) - 13pts, 10rebs, 2asts, 2stl, 1blk. 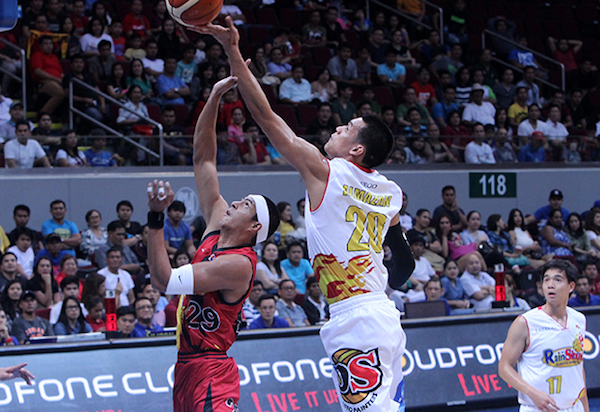 Raymond Almazan beats Arwind Santos to the rebound. June Mar Fajardo uses a drop step move against Rain or Shine.